Thanks to Bowflex, Counting is Obsolete. Use These Dumbbells and Say Goodbye to Counting FOREVER! | Keep It Up, David! 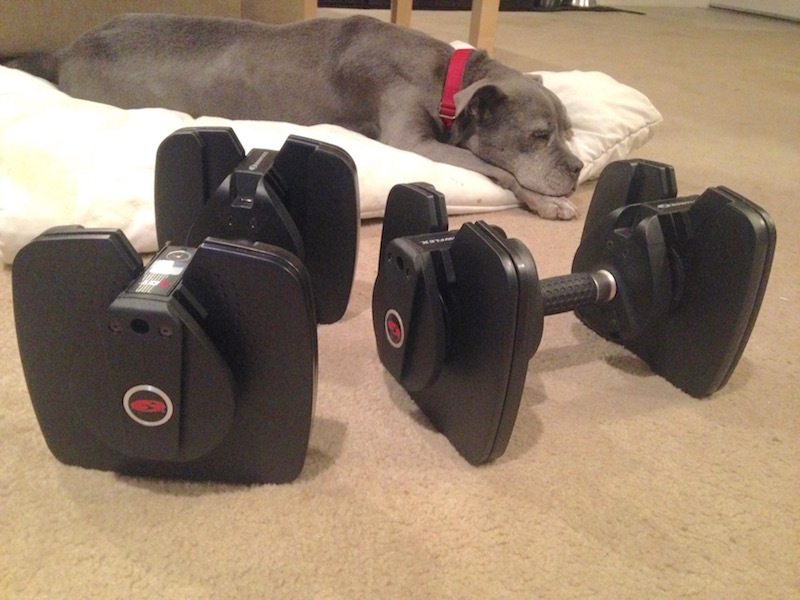 Introducing… the Bowflex SelectTech 560 Dumbbells! They count your reps for you. I haven’t counted a rep in weeks. If I knew this product was going to be invented, I wouldn’t have wasted five years in college! 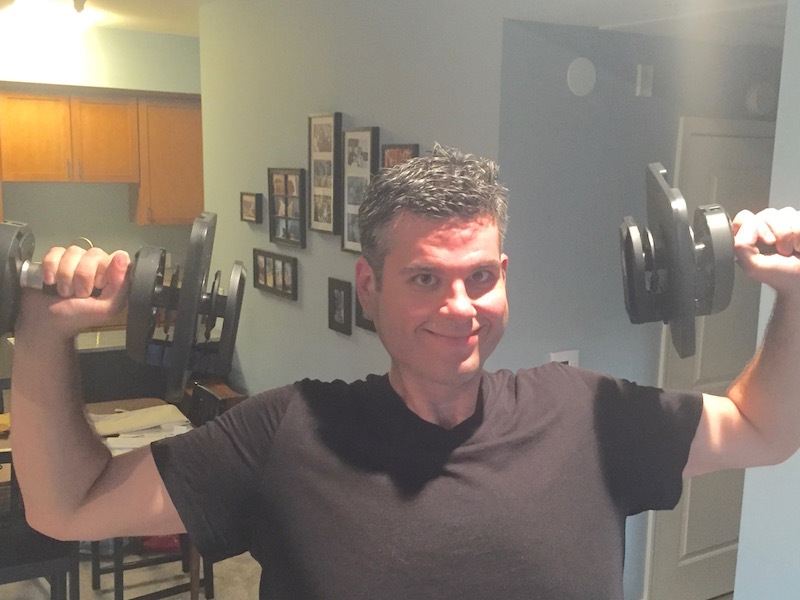 Seriously, though, these dumbbells are awesome. I got my set a few weeks ago. 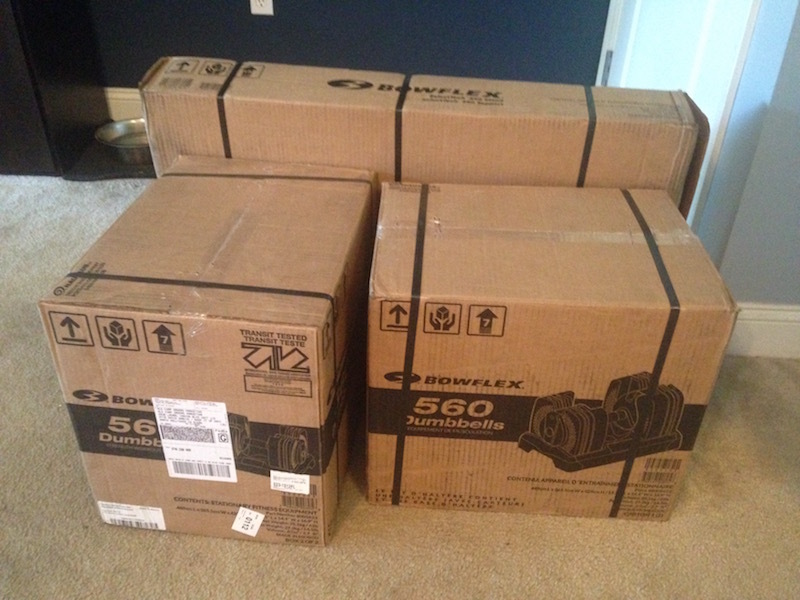 Bowflex sent them to me as payment for some work I did for them. It took me about an hour to unpack them, build the stand, and set them up. 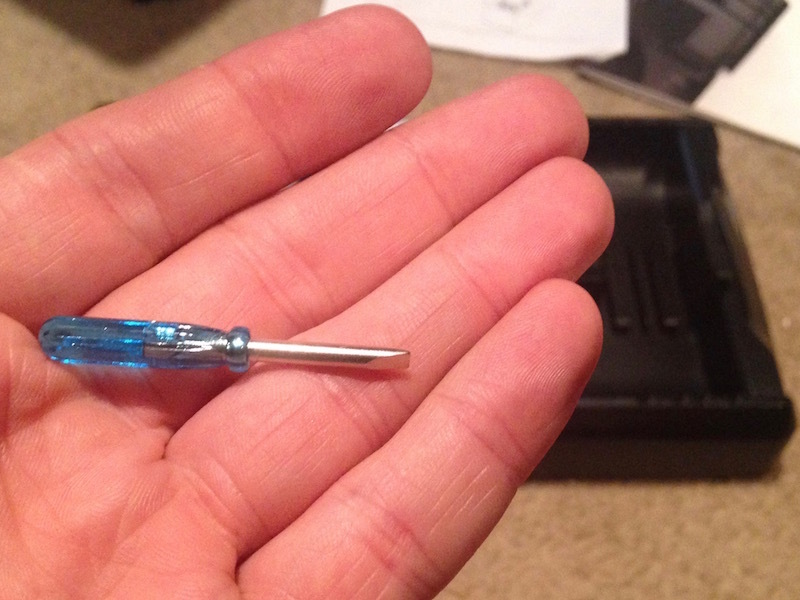 My favorite part of the construction process was working with the teeniest, tiniest screwdriver I’ve ever seen. It’s needed to open a battery compartment. There’s so many cool things about my SelectTech 560s. First of all, like the SelectTech 552s, which I also have, they replace an entire rack of dumbbells, because they’re adjustable and can be anywhere from 5 pounds to 60 pounds. And, they’re easier to adjust than the 552s, simply by turning the handle. (The 552s has adjustable dials, and while they’re not hard to adjust by any means, this method is much quicker. I can do it without taking my hand off the dumbbell, which is nice when I want to quickly increase the weight in between sets, for example.) The pound display is a little small, and can be hard to read if it’s in a shadow, but I got used to it pretty quickly. 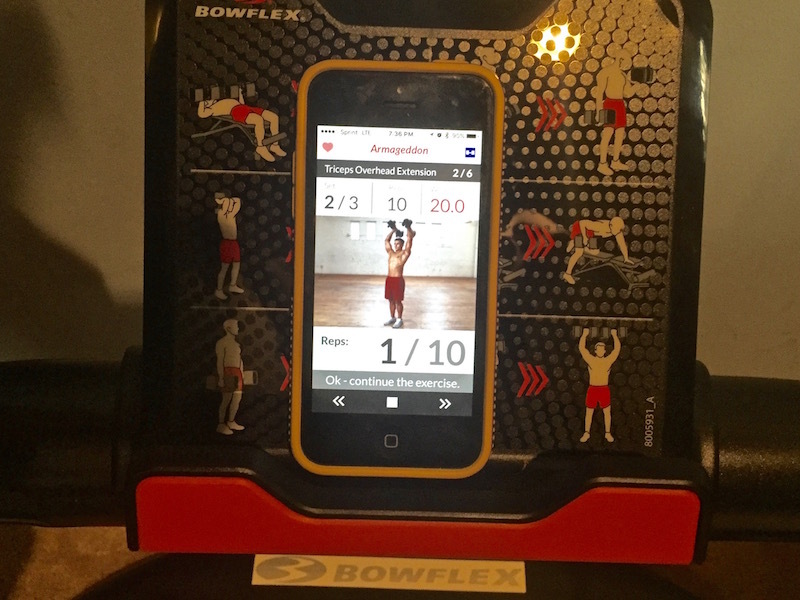 One of the dumbbells is outfitted with Bluetooth, and when you download the Bowflex 3DT app (which stands for 3-Dimensional Trainer), your movements can be tracked by your phone or tablet. This is how the dumbbells count your reps. It tracks your range of movement, and detects every time you do a bicep curl, or chest press, or whatever. The app also tracks how much weight you’re lifting, and because you set up a user profile that includes your age, weight, and height, it can also calculate how many calories you’re burning. There’s a bunch of pre-loaded workouts on the app. There’s a 6 Week Challenge, which consists of three 45-minute workouts each week that target different muscle groups and get increasingly more difficult. I haven’t done this yet – I’m waiting until I’m on a break from race training. There’s also six more workouts, like Legs of Steel, Back Attack, and Crazy Core, that range from 15-45 minutes. I’ve done a lot of these, and they’re great. They have a variety of exercises, and you typically do 3 sets of 10 reps of each. There’s videos that play on a loop, featuring gorgeous fitness models demonstrating each exercise, so you always know what to do. And because you can choose how much weight you’re lifting for each exercise, these workouts can be done by anyone, including beginners. That’s the screen during the Tricep Overhead Extension exercise during the Armageddon workout. Near the top, it says I’m on my second set of three, each set has 10 reps, and I’m lifting 20 pounds (in each hand). At the bottom, it shows that I’m on my first rep, and the shirtless dude in the center does the exercise with me, on video. You can also do your own workout with the 560s. There’s a ‘Just Lift’ option, where you basically teach the app whatever kind of exercise you’re doing, and it learns the range of motion and counts your reps. There’s an archive of dozens of exercises, with videos, so you can get ideas and learn new things. You can also ‘Create a Workout’, too, but I honestly haven’t played around with that feature yet. 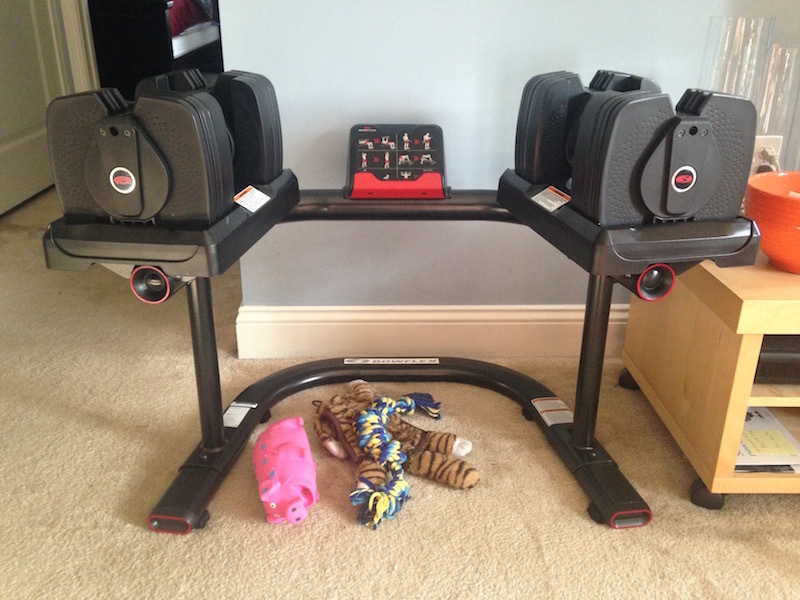 RELATED CONTENT: Read All About The Bowflex MAX Trainer M5! Most of the time, I instinctively count anyway. It’s a habit, thanks to years of gym memberships, that’s hard to break. But there’s been a few times where I’ve gotten wrapped up a the TV show, and having the rep count there is very helpful. It’s also helpful when I’m learning a new exercise. I can focus on form and doing it properly, and then glance up and see how many I’ve done. The other huge perk that comes of having your reps counted for you is that it helps the app compile data, and I’m a nerd that loves data. In addition to calorie count, the app tracks total pounds lifted. For example, if you do 10 reps with 10 pounds in each hand, that’s 200 pounds you’ve lifted during that set. [(10 + 10) x 10 = 200] During one workout, I lifted 14,865 lbs! There are a few small problems. Sometimes the rep count gets a little screwy when I modify an exercise – because it requires a bench, for example, and I don’t have a bench. If the exercise has a small range of motion (like shoulder shrugs), the app sometimes doesn’t register every rep. And a couple times, while doing one of their workouts, there’s been a glitch, and it says I’m done with a set before I’ve even started, and I can’t go back and do it over. Those things are minor, though, and they won’t stop me from using – and loving – my 560s. I’m all in. I’ve drunk the Kool-aid. 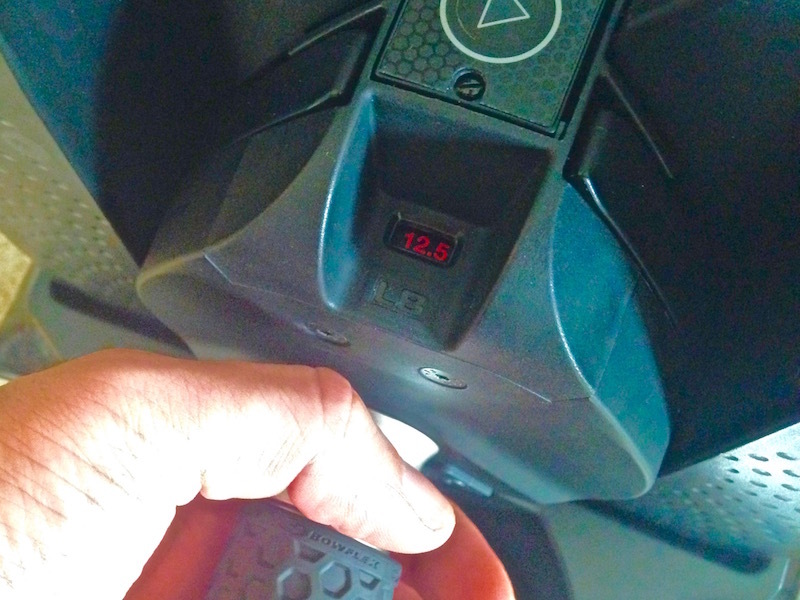 These dumbbells, and the technology they employ, have energized my workouts. They’ve gotten me out of a weightlifting rut, and I’m excited to keep learning from the app and trying new things. Click here to visit the Bowflex SelectTech 560 website. PS. In case you’re wondering, Maude doesn’t share my enthusiasm for the SelectTech 560s. In fact, she could care less. Sorry, Bowflex, but Maude won’t be providing a testimonial any time soon. This entry was posted on Thursday, June 16th, 2016 at 1:26 am and is filed under Uncategorized. You can follow any responses to this entry through the RSS 2.0 feed. You can leave a response, or trackback from your own site.